It is obvious intellectual property issues weave their way into creative businesses, such as music, writing and film. What I think is most interesting is how intellectual property issues are finding their way into nonobvious businesses. Outside of simply trademarking the name of the business, because of social media, all businesses are now creators of content. My post today talks about a nonobvious, but growing business – the yoga studio. I took my first yoga class in early January 2014 as my New Year’s resolution of a “new thing” to try. I quickly fell in love with it. When I’m not playing lawyer, you can usually find me on my mat. ALL the benefits you read about in the health magazine are true, and then some! It’s one of the best things I do just for me. In addition, I have met some truly lovely people I would not have otherwise met. As The Hubs calls them – all my bendy stretchy friends. I see several intellectual property issues that can crop up within a yoga studio. Belle with my new yoga mat I received for Valentine’s Day. 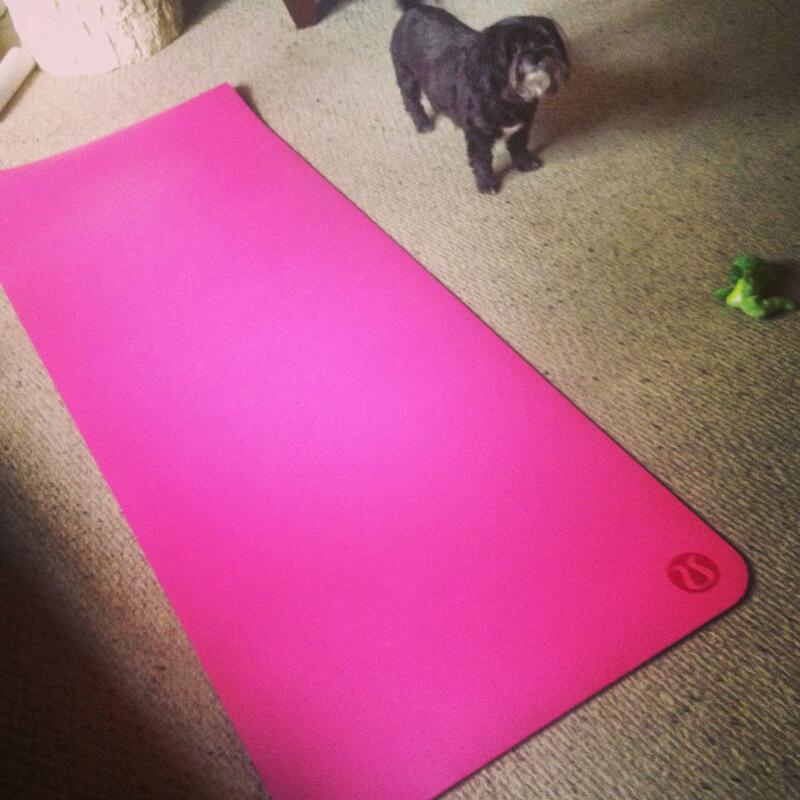 Belle said it looked like a good one for many downward dogs. I always take her advice on stuff like this. When I started thinking about the intellectual property issues that might face a yoga studio, the very obvious issue is the name of the studio. The name of a studio might be able to seek a service mark. A service mark is different from a trademark in that it is not tied to a good (like shoes, workout apparel, yoga mats) you are selling, but is rather linked with a service you are providing. But, there should be a word of caution when thinking of your studio name. Several well-known styles of yoga do have service marks and fiercely protect those marks. I know, it seems weird to have yogis wanting property rights over a name, but it is true. When it comes down to it, a yoga studio is very much still a business. Since 1971, Bikram Choudhury has held the trademark for his Bikram style yoga. For those not familiar, Bikram is a set of ordered asanas (yoga poses) performed in a room heated to very high temperatures. The company has been known to send nasty cease and desist letters to those using the name. He even attempted to receive a trademark on the phrase “Hot Yoga,” but was unsuccessful because the trademark office claimed it was too generic to receive protection. The other trademark issues come with all of the yoga apparel and prop manufacturers. Yoga clothing is a growing industry because of the increase in the numbers of those practicing. Outside of those practicing, it has a functionality to it that allows non-yogis to feel comfortable wearing it too. And, let’s be honest – this clothing girl thinks most of it is really cute too! Therefore, a trademark on a yoga clothing company would be very appropriate too. You would want to seek a trademark rather than a service mark because it would be tied to goods (tank tops, yoga pants, and mats) being sold. Outside of the obvious trademark issues, there are some not so obvious copyright issues. If you follow any yogis or yoga studios on Facebook, Instagram or other social media outlets, you will see there are a LOT of photos. I would dare say this generation of yogis have far more photos than any other generation. Each and every photo taken is subject to copyright protection. Meaning, at the point it is fixed in a tangible medium of expression (your camera, Instagram, etc.) the photo is subject to copyright protection. But, who owns those photos? Does the studio who initially posts the photo of their well-known teacher own the photo or does the teacher herself? In very simple terms, the person who takes the photo is the copyright owner. Even though the studio might post it on their social media outlets and help to share it, unless there is a written document transferring rights in the photos, the owner of the photos is the person who took the photo. The written document could be the employment contract between the studio and the teacher, so be sure to check for that too. I talked about photo ownership in my post dealing with Ellen DeGeneres in Selfie Felt Around the World. The second way copyright issues sneak into yoga studios is thru public performance licensing with music. If the studio plays music, they should definitely have licensing in place thru SESAC, BMI and ASCAP. Even if they have legally purchased the songs, they only purchased the rights for personal enjoyment and not for a public performance. You can read more about public performance rights by checking out my early post titled What is BMI, ASCAP and SESAC? Why Should My Bar/Gym/Event Care? The final way I think copyright law comes into play is the order of the poses one practices. In order for copyright protection to exist, there are three necessary elements. First, it has to be original, meaning you did not copy it. Second, it has to be a work of authorship, meaning you created it. Third, it has to be fixed in a tangible medium of expression. Things like improv are not subject to copyright protection because the “fixation” piece is missing. So, could a really great yoga flow be subject to copyright protection? Yes, maybe. A flow sequence could be subject to copyright protection, if the fixation requirement and the originality requirement is met. To me, the fixation is the hardest part. Would you write it down or put it on a poster or would you simply film it? Both would sufficiently “fix” the sequence. Thus, it would be subject to copyright protection. I think the bigger question to ask is should you? For me, the answer is no, unless you are writing a yoga book. I understand seeking protection in the trademark name for a studio. I would definitely encourage people to do that, especially if they have a unique name with a stylized design. I even get seeking protection for photos, since we have become a more visual society and licensing of photos for blogs, magazines and other media is so prevalent. You gotta pay for those cute tanks somehow, right? 🙂 If a person was to write a book on yoga and include instructions and sample flows, I would completely advocate for the book, as a whole, receiving a registered copyright because there would be a lot of creative elements from the cover design, to photos and to the words written. However, to copyright and thus bar others from using your flow sequence is a bit too far for me. The thing I love most about yoga is that it is accessible to all people. It doesn’t matter your age, your current health ability or really your income. If you come with a great attitude, no matter if you are the most fit person in the room or could use a little (or a lot, in my case) of improvement, you can have a challenging workout that is tailored to you and your strengths. Yoga should remain accessible to all people, even in the intellectual property realm. Keeping the business concerns in mind while balancing the accessibility idea of yoga will be sure everything stays in proper alignment. I wish you all a pleasant weekend and hope you spend time doing whatever makes your heart smile. You can bet I’ll be sneaking in some yoga. Find your sparkle and Namaste! What do you think about intellectual property law in the yoga realm? Take part in the COMMENTS section below and Stay Tuned In! This post is dedicated to two of the ladies who have really encouraged me in my yoga practice – Jennifer and Ana. They are so lovely in every way. Both are moving soon to take on new adventures, which I know they will totally rock in doing. I am so thankful our paths crossed at this time. I wish them each much light, peace and happiness. I am a better person for knowing them. With an ever evolving 10 year yoga practice, Ryanne’s blog presents the context for some of the headlines we’ve been reading about Bikram’s copyright claims. Bottom line, Bikram Yoga is a brand and to that extent capable of IP protection through trademark law. However, there’s no copyright available for ancient poses that predate all of us. What about a named worship that includes breath work demonstrating walking meditation and seated guided .meditations? Original created by me.